Last week I flew to Yerevan, Armenia to train a bureau of independent journalists. I was also fortunate enough to have time to explore the city and its surroundings. Yerevan is one of the world’s oldest continually-inhabited cities, dating back to the eighth century BC. It’s a bustling metropolis with a dramatic natural backdrop of mountains–including the twin peaks of Mount Ararat, a symbol of Armenian national identity. Yerevan has a perfect balance of fascinating museums, lively cafes, and day-trip sites within easy reach of the city. Tsitsernakaberd is a memorial dedicated to the 1.5 million Armenians in the Ottoman Empire who were massacred by the Turkish government beginning in 1915. 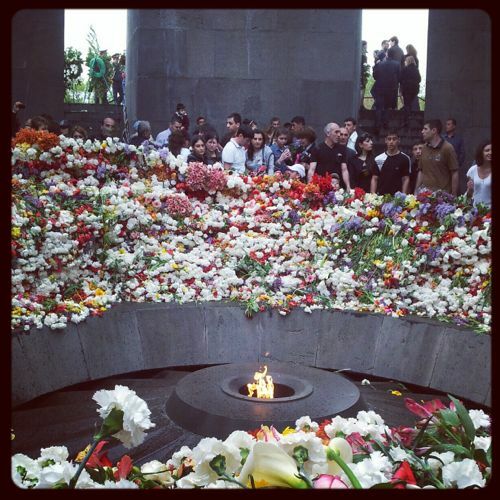 I visited Tsitsernakaberd on April 24th, Armenia’s national Genocide Remembrance Day, when hundreds of thousands of people came to lay flowers around an eternal flame. It is a sober place, one that is deep in symbolism and historical significance. Tsitsernakaberd is also home to the Armenian Genocide museum. The Matenadaran is one of the world’s largest repositories of medieval manuscripts, containing religious, scientific, philosophical, and historical texts. The manuscripts themselves are priceless works of art, and they provide a unique window into the history of the Armenian people and language. 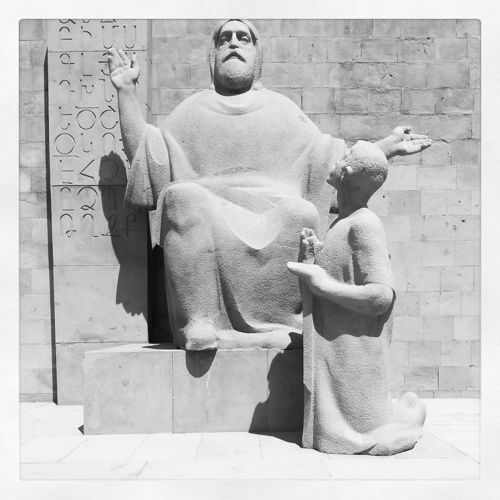 Pay the extra 2500 drams ($6) for an English-speaking tour guide, who will provide you with in-depth background about each manuscript on display, the restoration process, and its significance to Armenian culture. The Matenadaran also houses donated manuscripts from other countries, including some beautiful Persian texts. The Cafesjian Center is a modern art gallery, immediately recognizable by its massive, terraced “cascade” built into the surrounding hillside. 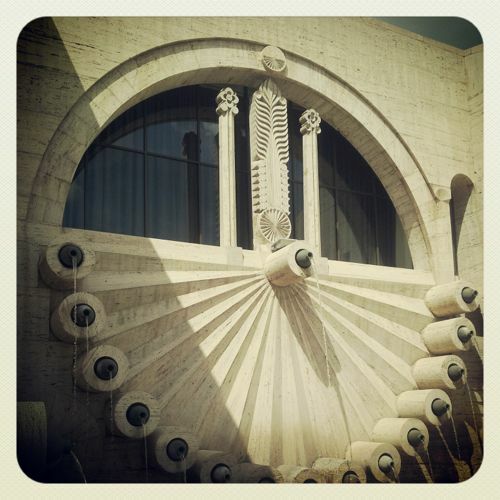 The New York Times called the Cafesjian Center “one of the strangest but most memorable museum buildings to open in ages.” It is a multi-storied building (connected on the inside by escalators and on the outside by an enormous staircase), each floor with its own garden and waterfall. Inside is a large holding of modern works by both Armenian and foreign artists, including one of the most comprehensive glass collections in the world. 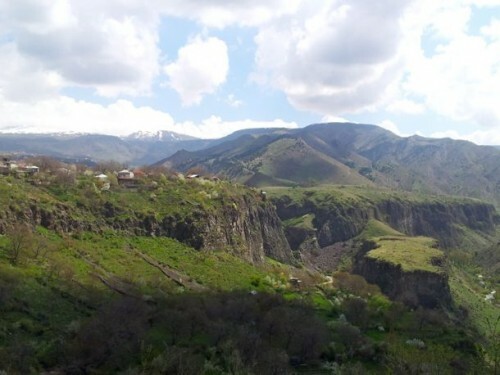 A half-hour from Garni lies the famous Geghard Monastery, surrounded by high cliffs. The monastery was founded in the fourth century, but the main church was constructed in 1215. 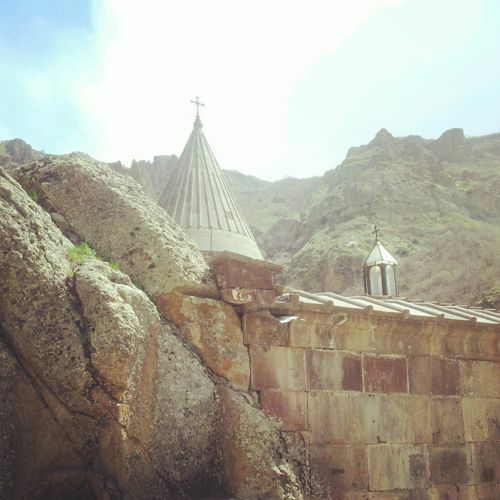 Geghard consists of a series of churches, chapels, and tombs carved into the surrounding mountainside. Explore intricately carved caverns and tunnels and when you’re done, visit the elderly women at the entrance of the monastery to sample some homemade Armenian treats like sweetbread and fruit lavash. 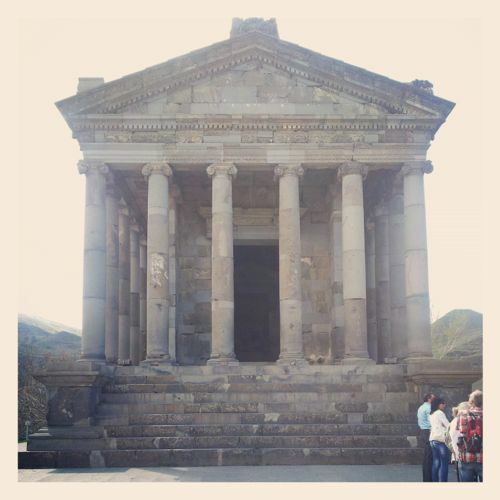 Garni and Gerhard together make a perfect full-day excursion outside of Yerevan. Armenian cuisine places an emphasis on fresh ingredients and herbs; it’s also known for savory barbecued meats. Also be sure to try the famous (and delicious) Armenian cognac–supposedly a favorite of Winston Churchill. Dolmama is an excellent restaurant with a “haute” take on traditional Armenian food. Their signature dish is dolma–ground meat with rice and herbs–which is remixed here using sirloin, rosemary, and chili. Dolmama strikes the perfect balance between upscale and cozy, with low light, rustic tiles, and aged wood floors. Caucasus Tavern is an eatery with an enormous menu of traditional dishes from around the Caucasus region. It has a somewhat kitschy “rural village” decor–a restaurant style I’ve found surprisingly common in my travels in Eastern Europe and the Caucasus. Regardless, the food is tasty and the prices are extremely affordable. Kavkazskaya Plennitsa is a themed restaurant based on the enormously popular Soviet comedy “Kidnapping, Caucasian Style” (about bride kidnapping in the Caucasus). It’s a fun, lively place that offers a window into classic pop culture from the region. Artashi Mot is an Armenian barbecue restaurant with relaxed fast-food service upstairs and a more formal sit-down restaurant downstairs. It’s regarded as one of the best BBQ spots in Yerevan. Yerevan is home to a number of cafes, from relaxed terraces to hip lounges. In addition to the places below, also check out the lively outdoor cafes surrounding Liberty Square and Swan Lake at night. The Club is a stylish cafe decorated with gramophones, vintage radios, and typewriters. This spot serve drinks and small plates, and also has a small stage for live performances. Jazzve has several cafes around Yerevan. The location on Tumanyan has cool, shaded outdoor seating with big, comfy chairs. In addition to coffee and tea, Jazzve also serves breakfast and appetizers. Artbridge is a bookstore and cafe popular with expats. It’s a friendly, cozy spot with a tasty seasonal menu and, unlike many spots in Yerevan, has separate smoking and non-smoking sections. *Thanks to Glenn Kates, Artur Papyan, and Olga Buriak for their Yerevan tips! This entry was posted in Cities, Explore and tagged armenia, camilla, caucasus, cognac, do, explore, garni, Geghard, mount ararat, taste, travel, yerevan.